This is a simple to understand step-by-step Recipe for making at home tasty Maharashtrian Style Paneer Steam Modak. This is a Modak with Paneer stuffing, prepared in the typical Ukadiche Modak style. 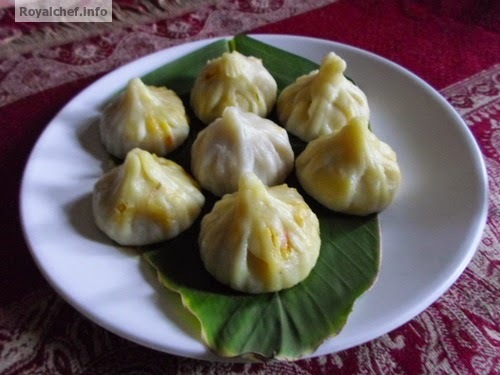 This Modak, which has a spicy taste can be served as a main course dish or as a unique and rare snack or starters item for any kind of party. Heat the Oil in a Kadhai and add the Asafoetida, Onion, Ginger-Garlic Paste, Green Chilies and fry for two-three minutes on a slow flame. Add the Salt, Paneer, Coriander, Lemon Juice and mix it well. Heat the two glasses Water in a Vessel and add the salt and Oil. Then add the Rice Flour, Refined Flour then mix it well and cover with a lid for two minutes. Remove from the flame and keep it into a plate and then prepare the thick Dough with using Water. 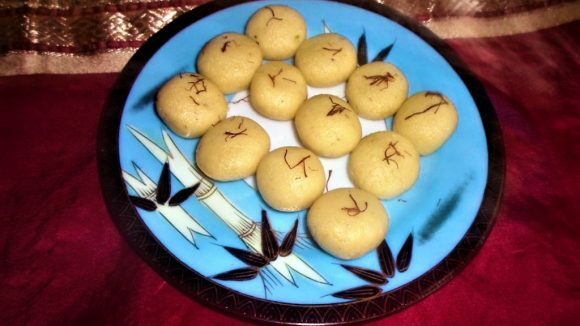 Prepare small balls from the Dough and pat them with with your hand on your palm to prepare Puri size shapes and then fill a table spoon mixture into Puri, fold the Puri and give the Modak shape or you can also use a Modak mould to prepare the Modak. Heat the water in a Vessel and keep the strainer over the Vessel. Cover the strainer with the Banana leaf and arrange the Modak over the Banana leaf. Then cover with a Plate and steam the Modak for ten-twelve minutes. कृती : एका कढई मध्ये तेल गरम करून त्यामध्ये हिंग, कांदा, आले-लसूण व हिरवी मिरची घालून थोडे परतून घ्या मग त्यामध्ये मीठ, पनीरचे तुकडे, कोथंबीर व लिंबू रस घालून मिश्रण मिक्स करून घ्या. पातेल्या मध्ये २ कप पाणी गरम करायला ठेवा. पाणी गरम झाल्यावर त्यामध्ये मीठ व तेल घाला. नंतर त्यामध्ये तांदळाचे पीठ व मैदा घालून मिक्स करून त्यावर झाकण ठेवा. चांगली वाफ आल्यावर पीठ परातीत काढून घ्या थंड पाण्याचा वापर करून पीठ खूप मळून घ्या. नंतर त्याचे लिंबा एवढे गोळे करून हातावर थापून त्याची पुरी करा व त्यामध्ये एक टे स्पून मिश्रण भरा व पुरी बंद करून मोदकाचा आकार द्या. असे सर्व मोदक करून घ्या. मोदक पात्रा मध्ये पाणी चांगले गरम करून त्यावरती चाळणी ठेवून केळीचे पान ठेवा. पानावर जेव्हडे मोदक बसतील तेवढे ठेवा वरती परत केळीचे पान ठेवा व मोदक पात्राचे झाकण लावून घ्या. दहा ते बारा मिनिटे मोदक उकडून घ्या. गरम गरम खायला द्या.